Russell & Kitty here. Glass advertising signs have been around for a number of years in the finest gift stores such as Gump’s in San Francisco and Macy’s. 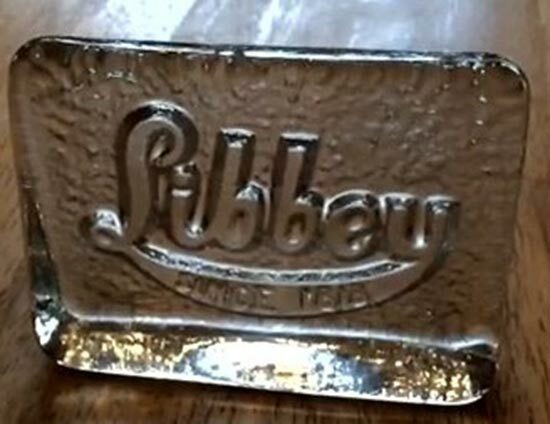 When a store orders a large quantity of pieces, the glass house would enclose a sign to be put on the shelf of glass to identify which company made the glass. Most of the signs today are made of plastic or decorated card board, but before plastic or cardboard there was glass. Since this is Stretch Tuesday, let’s talk about the glass signs that would be put on the shelf or shelves with the stretch glass. 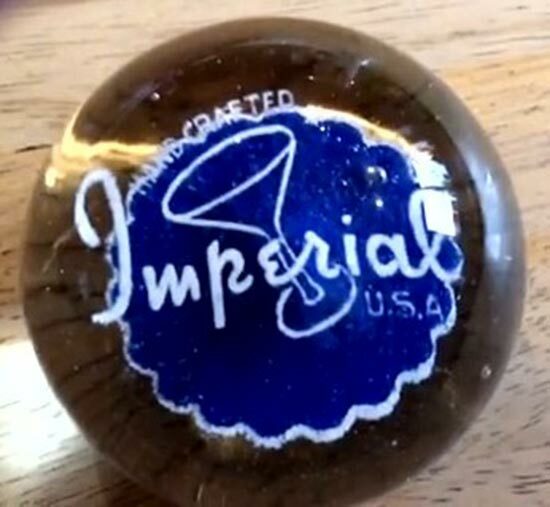 Imperial’s paper weight sign is probably best known in the carnival glass world. 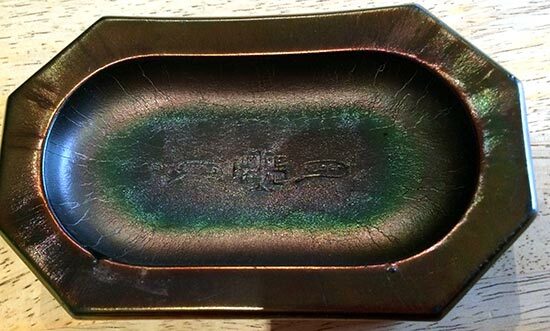 The bottom of the paper weight has embossed Nuart in an oval on both sides of the IM PE RI Al in a cross. The bottom side has embossed Imperial Glass Company, Bellaire Ohio USA. The top side has embossed IMPERIAL ART GLASS. All that are known are in a very dark amethyst glass. 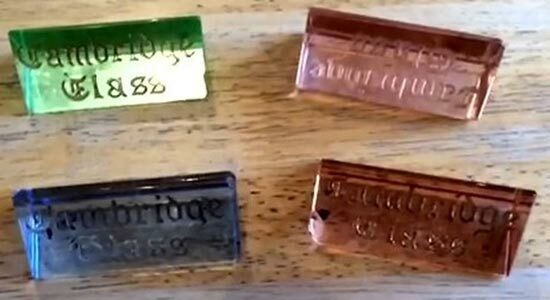 Most of the Imperial paper weight signs have some damage which leads us to believe that these pieces were used not just decorative pieces of glass. The second type of glass sign is by Fenton Art Glass. Stretch glass collectors are familiar with this sign. It is oval with Fenton Art Glass embossed on the front of the sign. If you’ll notice, there are three scalloped decorations on the front – one on top and one on each side. Back in the dark ages before computers, we used to get our “glass fix” by reading the Antique Trader cover to cover each week the minute it arrived in our mail box. We lived in the West so we got our Trader usually two to six days later than the people in the East near where it was printed. It was a ‘fighting’ matter as it was so frustrating to call on a piece of glass that sounded just perfect for our collection, but it had been sold last week! Phone calls were not that cheap back in those days either! Then the descriptions that were used by the sellers were interesting considering most dealers didn’t have the foggiest idea about the name that Hartung or Presznick used for the piece! Of course, Hartung and Presznick couldn’t agree on the names either!!! 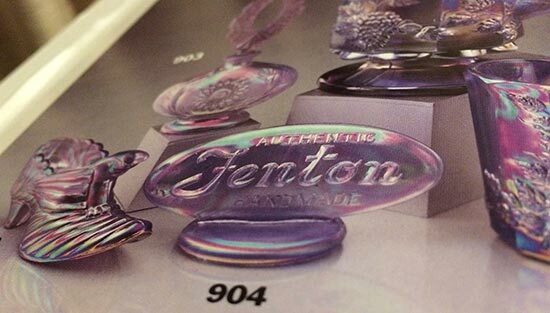 One day, we read about a Fenton glass piece with 3 sea shells on it in sea blue color. It was cheap so we sent them a check (no PayPal in those days – everything was a check or money order and a few people would even send cash, but there was a problem with cash!). Didn’t bother with a call as already had used the phone allowance! After a month or two, right when we were going to stop payment on the check, a package arrived. 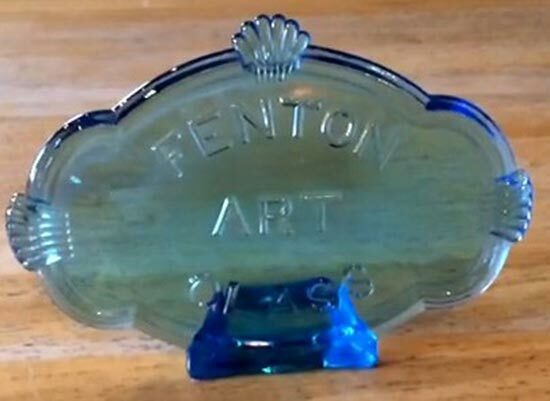 When opened, there was a neat perfect Fenton Glass sign in celeste blue. Called Frank Fenton the next morning to find out what it was. This is before any Fenton Books and Frank couldn’t tell for sure what it was. So we sent him pictures by air mail. He received them a couple of days later and he called us. It was a gift store sign and Frank said that he looked all over the factory and also his family’s homes and couldn’t find one. He wanted to purchase ours, but we didn’t want to sell it. Told him that the next one we find, we would let him know. Well in all of these years, we never found another one for him; but we purchased the one from the museum in Florentine Green. We have seen one in topaz and another in cobalt blue is pictured in Tom Smith’s Fenton Rarities book. Am sure that there are more of them around, but they are elusive. 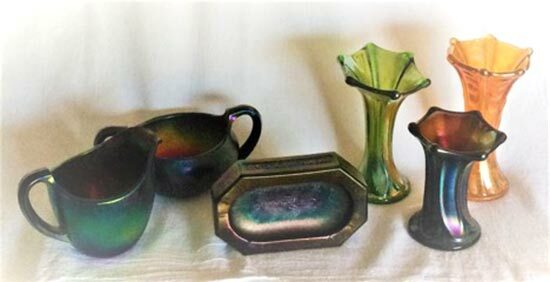 Talking about the old Antique Trader, so many people said that they had old GI glass for sale. They, of course, had new IG glass for sale! 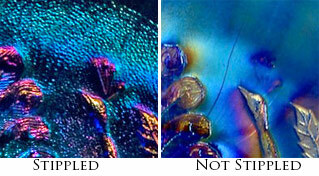 Those are the only two old iridescent signs that we know of. Imperial put out a number of signs over the years that are not iridescent. The sign on the left is an old (probably 1940 to 1950’s) with the wine glass on it. The topaz sign on the right is newer and produced by the Imperial Club in a variety of colors. Notice the sign on the right has a stippled background and no wine glass. 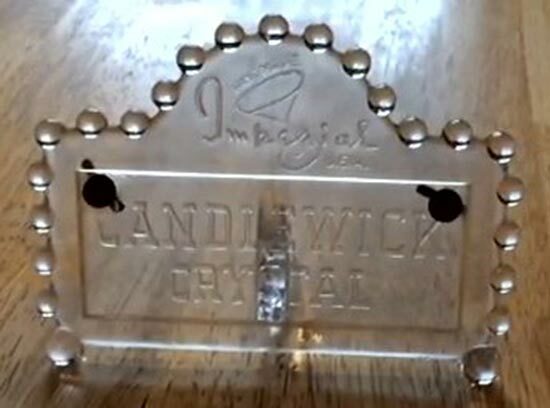 The Candlewick Crystal sign was for the line of Candlewick Crystal. The two metal grommets held a calendar in place. The Imperial paperweight on the right is a heavy paper weight! 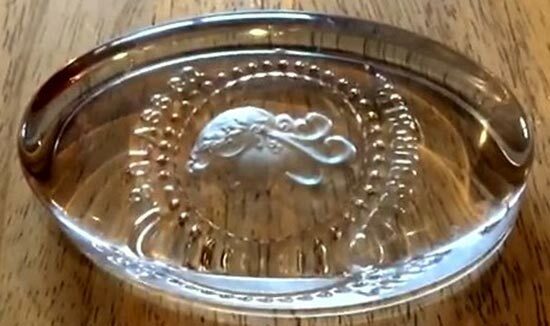 The story that goes with it is that the paperweight was given to the employees instead of a turkey at Thanksgiving time when the employees could have really used a turkey for their families. The employees got upset. They staged a rally in front of the factory and threw their paperweights on the sidewalks so these are scarce. After we heard the story we watched for these paperweights, there are a lot of these paperweights around the West, so the story must be a fantasy to sell the paperweights. 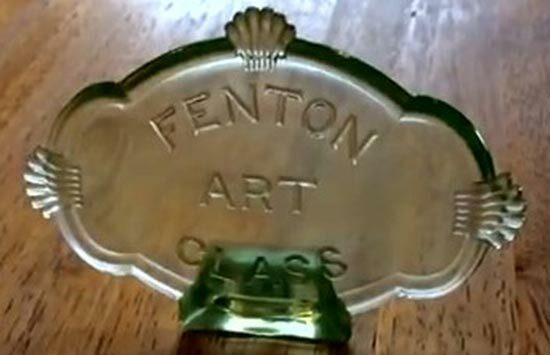 Fenton Art Glass Company made the two above types of signs in the 1990’s in a variety of colors. 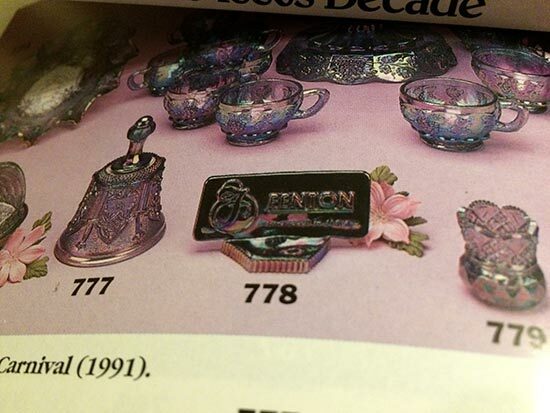 Both of these pictures are from Measell’s Fenton Glass the 1990’s Decade book. These were mainly sold to the Fenton collectors, but the stores could also purchase them. They were not given to stores. The two Cambridge Glass signs in the back are old ones and the two in the front are later ones. Can’t you just see your Inverted Strawberry pieces with these signs on the shelf to advertise Cambridge Glass? 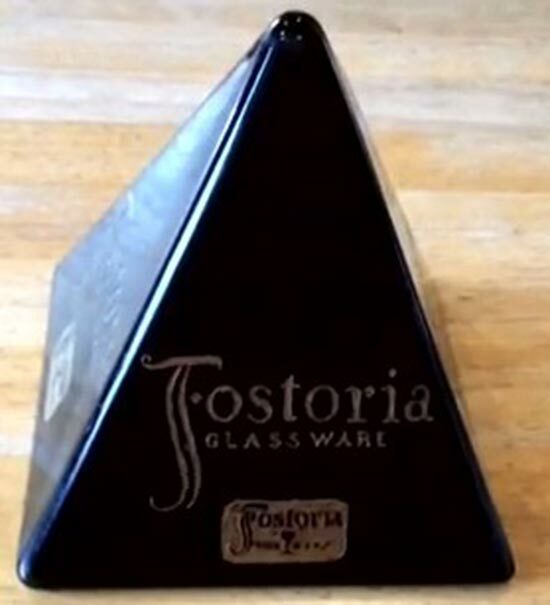 Wouldn’t your Brocaded pieces look nice with any of these Fostoria Signs advertising them? 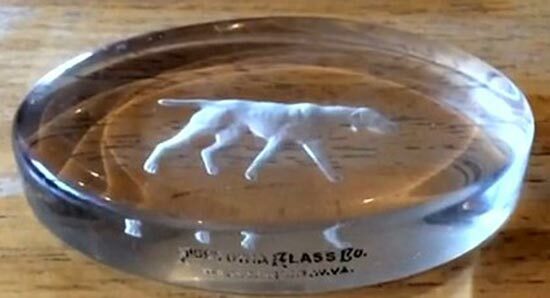 This U.S. Glass paperweight glass sign could have been used with the stretch and carnival U.S. Glass pieces. These are a couple of other paperweight and glass signs. 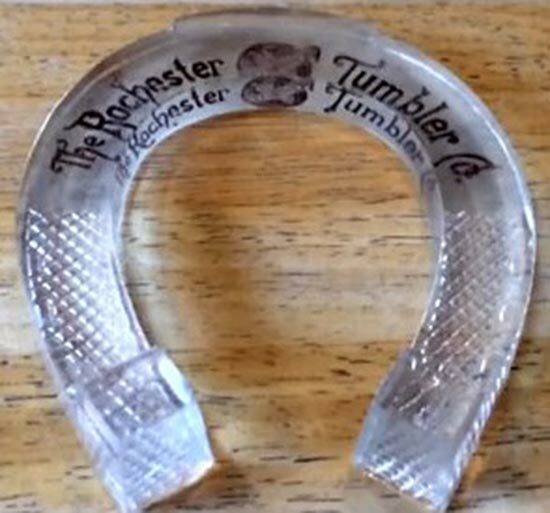 The Rochester Tumbler Co. and the Thos. 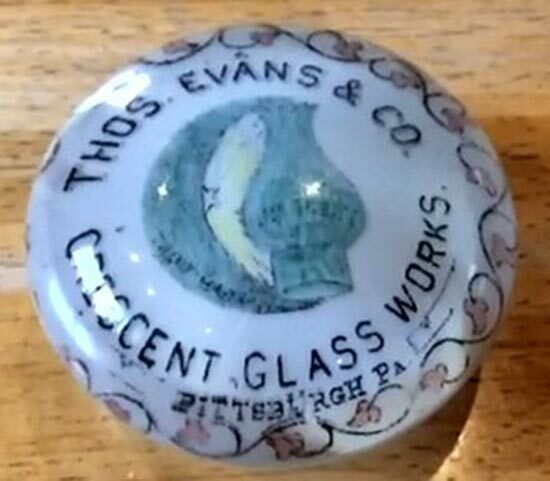 Evans Crescent Glass Works are older than carnival glass, but they are different which makes the collection more interesting. It is amazing the different types of glass that you can collect.